An uninterruptible power supply is an electrical apparatus that provides emergency power to a load when the input power source, typically mains power, fails. The on-battery runtime of most uninterruptible power sources is relatively short but sufficient to start a standby power source or properly shut down the protected equipment. 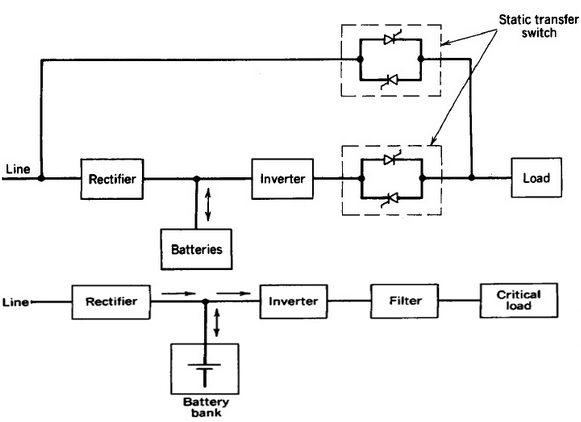 Figure below shows Uninterruptible Power Supply. • In this type of UPS, the system always remains on battery, whether mains ac is present or not. When mains ac is present, it provides power to DC supply of inverter section as well as charges the battery simultaneously. • When mains ac is not present, it will run the connected load till the battery has a recommended dischargeable level. In online UPS, the batteries are always connected to the inverter, so that no power transfer switches are necessary. • When power loss occurs, the rectifier simply drops out of the circuit and the batteries keep the power steady and unchanged. • The offline/standby UPS (SPS) offers only the most basic features, providing surge protection and battery backup. • When mains supply is not available ,then inverter is turned on. 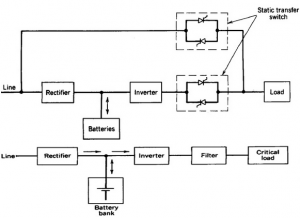 • Inverter takes power from the battery .the load is connected to inverter output through UPS static switch. The power flow diagram is shown. • The mains statics switch is always on and keeps load connected to the mains. The mains static switch turned off when mains is not available. • When the charger feeds power only to the battery .hence handling capacity is reduced.